This article is about the 1995 film. For the theoretical type of planet, see ocean planet. For other uses, see Water World. Waterworld is a 1995 American post-apocalyptic science fiction action film directed by Kevin Reynolds and co-written by Peter Rader and David Twohy. It was based on Rader's original 1986 screenplay and stars Kevin Costner, who also produced it with Charles Gordon and John Davis. It was distributed by Universal Pictures. The setting of the film is in the distant future. Although no exact date was given in the film itself, it has been suggested that it takes place in 2500. The polar ice cap has completely melted, and the sea level has risen over 7,600 m (25,000 feet), covering nearly all of the land. The plot of the film centers on an otherwise nameless antihero, "The Mariner", a drifter who sails the Earth in his trimaran. 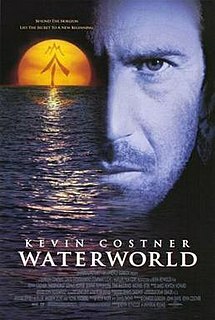 The most expensive film ever made at the time, Waterworld was released to mixed reviews, praising the futuristic setting and premise but criticizing the characterization and acting performances. The film also was unable to recoup its massive budget at the box office; however, the film did later become profitable due to video and other post-cinema sales. The film was also nominated for an Academy Award in the category Best Sound at the 68th Academy Awards. The film's release was accompanied by a novelization, video game, and three themed attractions at Universal Studios Hollywood, Universal Studios Singapore, and Universal Studios Japan called Waterworld: A Live Sea War Spectacular, all of which are still running as of 2019[update]. Long after the melting of the polar ice caps in the 21st century, the sea levels have covered every continent on Earth. The remains of human civilization live on ramshackle floating communities known as atolls, having long forgotten about living on land. People believe that there should be a mythological "Dryland" somewhere in the endless ocean. The Mariner (Kevin Costner), a lone drifter, arrives on his trimaran to trade dirt, a rare commodity, for other supplies. The atoll's residents see that the Mariner is a mutant with gills and webbed feet and decide to drown him in the atoll's recycling pit—a kind of liquid compost facility. Just then, the atoll is attacked by the Smokers, a gang of pirates seeking a girl named Enola (Tina Majorino) who, according to their leader the Deacon (Dennis Hopper), has a map to Dryland tattooed on her back. Enola's guardian, Helen (Jeanne Tripplehorn), attempts to escape with Enola on a gas balloon with Gregor (Michael Jeter), an inventor, but the balloon is released too early. Helen instead rescues the Mariner and insists that he take the two of them with him. The three escape to open sea aboard the trimaran. They are pursued by the Smokers, and, though they escape, Helen's naïve actions result in damage to the Mariner's boat and he angrily cuts her hair, followed by Enola's hair for repeatedly taking his crayons. Helen explains that she believes humans once lived on land and demands to know where the Mariner collected his dirt. He provides her with a diving bell and dives with her underwater, showing the remains of a city and the dirt on the ocean's floor, affirming Helen's belief. When they surface, they find that the Smokers have caught up to them, threatening to kill them if they do not reveal Enola, who is hiding aboard the boat. The Smokers abduct Enola and try to kill Helen and the Mariner. The Mariner takes Helen, and they dive underwater to avoid capture, with the gilled Mariner helping Helen to breathe. When they surface, they find that his boat has been destroyed. Gregor manages to catch up to and rescue them, taking them to a new makeshift atoll inhabited by the survivors of the first attack. The Mariner takes a captured Smoker's jet ski to chase down the Deacon aboard the hulk of the Exxon Valdez. With most of the Smokers below deck to row the tanker, the Mariner confronts the Deacon, threatening to ignite the reserves of oil still on the tanker unless he returns Enola. The Deacon calls the Mariner's bluff, knowing that would destroy the ship, but, to his surprise, the Mariner drops a flare into the oil. The lower decks of the ship are engulfed in flame, and the ship starts to sink. The Mariner rescues Enola and escapes via a rope from Gregor's balloon with Helen and the Atoll Enforcer aboard. As the Mariner brings Enola to Helen, the Deacon manages to grab the rope to escape the sinking ship. He is kicked off into the water, but climbs aboard a jet ski. He fires upon the balloon, shaking Enola from the balloon and into the ocean. As The Deacon and some of his men converge on Enola to capture her, The Mariner makes an impromptu bungee jump from the balloon to grab Enola right before the Deacon and his men collide and die in the explosion. Sometime later, Gregor has been able to identify the tattoo on Enola's back as coordinates with reversed directions. Following the map, Gregor, the Mariner, the Atoll Enforcer, Helen, and Enola discover Dryland, the top of Mount Everest, filled with vegetation and wildlife. They also find a crude hut with the remains of Enola's parents. Realizing he does not belong on Dryland, the Mariner decides that he cannot stay as the sea calls to him. He finds a new wooden sailboat and departs as Helen and Enola bid their goodbyes to him. The film marked the fourth collaboration between Costner and Reynolds, who had previously worked together on Fandango (1985), Robin Hood: Prince of Thieves (1991), and Rapa Nui (1994), the latter of which Costner co-produced but did not star in. Waterworld was co-written by David Twohy, who cited Mad Max 2: The Road Warrior as a major inspiration. Both films employed Dean Semler as director of photography. During production, the film was plagued by a series of cost overruns and production setbacks. Universal initially authorized a budget of $100 million, but production costs eventually ran to an estimated $175 million, a record sum for a film production at the time. Filming took place in a large artificial seawater enclosure similar to that used in the film Titanic two years later; it was located in the Pacific Ocean off the coast of Hawaii. The final scene was filmed in Waipio Valley on the Big Island, also referred to as The Valley of Kings. The production was hampered by the collapse of the multimillion-dollar set during a hurricane. Additional filming took place in Los Angeles, Huntington Beach, and Santa Catalina Island, and the Channel Islands of California. The production featured different types of personal watercraft (PWC), especially Kawasaki jet skis. Kevin Costner was on the set for 157 days, working 6 days a week. At one point, he nearly died when he got caught in a squall while tied to the mast of his trimaran. Professional surfer Laird Hamilton was Kevin Costner's stunt double for many water scenes. Hamilton commuted to the set via jet ski. Mark Isham's score, which was not recorded and only demos were completed for approximately 25% of the film, was reportedly rejected by Costner because it was "too ethnic and bleak", contrasting the film's futuristic and adventurous tone; Isham offered to try again but was not given the chance. James Newton Howard was brought in to write the new score. Joss Whedon flew out to the set to do last minute script rewrites and later described it as "seven weeks of hell"; the work boiled down to editing in Costner's ideas without alteration. The state of Hawaii had more than $35 million added to its economy as a result of the colossal film production. Despite their reported clashes, the director and star reunited almost two decades later for the History Channel miniseries Hatfields & McCoys. Loe Real, one of the two 60-foot (18 m) Waterworld trimarans in 2013; Newport Beach, California. Inspired by racing trimarans built by Jeanneau Advanced Technologies' multi-hull division Lagoon; a custom 60 foot (18 m) yacht was designed by Marc Van Peteghem and Vincent Lauriot-Prevost and built in France by Lagoon. Two versions were built, a relatively standard racing trimaran for distance shots, and an effects-laden transforming trimaran for closeup shots. 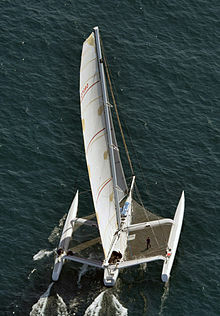 The first trimaran was launched on 2 April 1994, and surpassed 30 knots (56 km/h; 35 mph) in September of that year. The transforming version was first seen in the film as a sort of raft with a three-bladed egg-beater windmill. When needed, levers could be triggered that would flatten the windmill blades while raising a hidden mast to full racing height. A boom emerged, previously hidden in the hull, and the two sails were automatically unfurled. Once the transformation was complete this version could actually sail, although not as well as the dedicated racer. The transforming version is in private hands in San Diego, California. For many years, the racing version was kept in a lake at Universal Studios Florida, before being restored for use as a racing trimaran named Loe Real, which was (as of 2012) being offered for sale in San Diego. Kevin Reynolds received full credit as director, but he did leave the project as star Kevin Costner was constantly plaguing him with unwanted "back-seat driver director" mentality in nearly every single scene, to the point that Reynolds left the project and Costner himself continued it. Due to the runaway costs of the production and its expensive price tag, some critics dubbed it "Fishtar" and "Kevin's Gate", alluding to the flops Ishtar and Heaven's Gate, although the film debuted at the box office at #1. With a budget of $172 million (and a total outlay of $235 million once marketing and distribution costs are factored in), the film grossed $88 million at the North American box office. The film did better overseas, with $176 million at the foreign box office, for a worldwide total of $264 million. However, even though this figure surpasses the total costs spent by the studio, it does not take into account the percentage of box office gross that theaters retain, which is generally up to half; but after factoring in home video sales and TV broadcast rights among other revenue streams, Waterworld eventually became profitable. Contemporary reviews for the film were mixed. Roger Ebert gave Waterworld 2.5 stars out of 4 and said: "The cost controversy aside, Waterworld is a decent futuristic action picture with some great sets, some intriguing ideas, and a few images that will stay with me. It could have been more, it could have been better, and it could have made me care about the characters. It's one of those marginal pictures you're not unhappy to have seen, but can't quite recommend. "James Berardinelli of Reelviews Movie Reviews was one of the film's few supporters, calling it "one of Hollywood's most lavish features to date". He wrote: "Although the storyline isn't all that invigorating, the action is, and that's what saves Waterworld. In the tradition of the old Westerns and Mel Gibson's Mad Max flicks, this film provides good escapist fun. Everyone behind the scenes did their part with aplomb, and the result is a feast for the eyes and ears." Rotten Tomatoes gives the film a score of 44% based on reviews from 55 critics, with an average rating of 5.2/10. The site's critical consensus is: "Though it suffered from toxic buzz at the time of its release, Waterworld is ultimately an ambitious misfire: an extravagant sci-fi flick with some decent moments and a lot of silly ones." Metacritic gives the film a score of 56/100, based on reviews from 17 critics, in the range of "mixed or average reviews". Waterworld was released on VHS on July 9, 1996 and on DVD on November 1, 1998. The film was released on Blu-ray on October 20, 2009. In December 2018, Arrow Video released a special edition of the film which contains 3 different cuts (theatrical cut, extended US TV cut, and the extended fan edit "Ulysses" cut, which removes the censoring present in the TV cut). The film was repackaged in a number of forms, including a 1995 Gottlieb Amusements (later Premier, both now defunct) pinball machine. Video games based on the film were released for the Super NES, Game Boy, Virtual Boy, and PC. There was to be a release for the Genesis, but it was canceled and was only available on the Sega Channel. A Sega Saturn version of the game was also planned, and development was completed, but like its Genesis counterpart it was cancelled prior to release. The Super NES and Game Boy releases were only available in the United Kingdom and Australia. While the Super NES and Virtual Boy versions were released by Ocean Software, the PC version was released by Interplay. A novelization was written by Max Allan Collins and published by Arrow Books. It goes into greater detail regarding the world of the film. A sequel comic book four-issue mini-series entitled Waterworld: Children of Leviathan was released by Acclaim Comics in 1997. Kevin Costner did not permit his likeness to be used for the comics, so the Mariner looks different. The story reveals some of the Mariner's back-story as he gathers clues about where he came from and why he is different. The comic expands on the possible cause of the melting of the polar ice caps and worldwide flood, and introduces a new villain, "Leviathan", who supplied the Deacon's Smoker organization. The comic hints at the possibility that the Mariner's mutation may not be caused by evolution but by genetic engineering and that his origins may be linked to those of the "Sea Eater", the sea monster seen during the fishing scene in the film. There are attractions at Universal Studios Hollywood, Universal Studios Japan, and Universal Studios Singapore based on the film. The show's plot takes place after the film, as Helen returns to the Atoll with proof of Dryland, only to find herself followed by the Deacon, who survived the events of the film. The Mariner arrives after him, defeats the Deacon and takes Helen back to Dryland while the Atoll explodes. ^ "WATERWORLD (12)". British Board of Film Classification. 1995-07-26. Retrieved 2012-05-24. ^ a b c Weinraub, Bernard (July 31, 2010). "'Waterworld' Disappointment As Box Office Receipts Lag". The New York Times. Archived from the original on August 24, 2010. ^ a b c "Waterworld (1995)". Box Office Mojo. 1995-09-26. Retrieved 2010-01-03. ^ The Making of Waterworld by Janine Pourroy (August 1995). Production designer Dennis Gassner states: "The date was 2500." ^ a b Stewart, Andrew (August 11, 2012). "B.O. reality gets lost in perception". Variety. Retrieved July 18, 2016. ^ Fleming Jr., Mike (August 7, 2013). "Isn't It Time To Take 'Waterworld' Off The All-Time Flop List?". Deadline Hollywood. Retrieved August 13, 2013. ^ a b Eller, Claudia; Welkos, Robert W. (September 16, 1994). "Plenty of Riptides on 'Waterworld' Set: With key crew people quitting and reported turmoil, logistical and organizational problems, the big-budget film, scheduled for release in summer of '95, could end up costing more than any movie ever made". Los Angeles Times. Retrieved November 20, 2014. ^ "Stashed Chats: Kevin Costner talks "Draft Day"". thestashed.com. 2014-04-10. Archived from the original on 2014-04-12. Retrieved 2014-08-05. ^ "Kevin Costner's Hawaii Uh-Oh". people.com. 1995-05-29. Retrieved 2014-08-05. ^ "Waterworld (James Newton Howard)". Filmtracks. 1995-08-01. Retrieved 2010-01-03. ^ "Waterworld and troubles for Blu-ray?". Mania.com. Archived from the original on 2010-05-04. Retrieved 2010-01-03. ^ Robinson, Tasha (September 5, 2001). "Joss Whedon". The A.V. Club. Retrieved August 19, 2012. ^ "The Most Expensive Movies Ever Made". Forbes.com. Retrieved 2010-01-03. ^ a b c d "The Mariner's Trimaran". October 27, 2009. Archived from the original on 2009-10-27. ^ ""Loe Real" - 60' Jeanneau Custom Trimaran". Morrelli & Melvin. 2012. Archived from the original on 2014-04-19. Retrieved 2014-04-17. ^ "Waterworld (PG-13)". The Washington Post. 1995-07-28. ^ "Married with Movies: Waterworld - Two-Disc Extended Edition". Archived from the original on 10 March 2011. Retrieved 2013-07-16. ^ Natale, Richard (1995-07-31). "Waterworld Sails to No. 1 : Movies: The $175-million production takes in $21.6 million in its first weekend. But unless it enlarges its appeal, it will probably gross about half its cost". The Los Angeles Times. Retrieved 2010-12-30. ^ Eyerly, Alan (1995-07-31). "Strong Opening Weekend for 'Waterworld': Fans: Why do people endure epic waits in line to see big movies? It's, like, a party". The Los Angeles Times. Retrieved 2010-12-30. ^ Ebert, Roger (July 28, 1995). "Waterworld". The Chicago Sun-Times. Retrieved 2011-03-28. ^ Berardinelli, James. "Waterworld". Reelviews. Retrieved 2010-12-02. ^ "Waterworld (1995)". Rotten Tomatoes. Fandango Media. Retrieved February 15, 2018. ^ "Waterworld Reviews". Metacritic. CBS Interactive. Retrieved 2013-06-10. ^ "Waterworld Blu-ray - Arrow Films". arrowfilms.com. Retrieved 2 October 2018. ^ "Chapter Two - The Ulysses Cut - The Unheard Nerd". The Unheard Nerd. Retrieved 2 October 2018. ^ "The 68th Academy Awards (1996) Nominees and Winners". oscars.org. Retrieved 2011-10-23. ^ "Internet Pinball Machine Database: Premier 'Waterworld'". Retrieved 2009-06-26. Wikimedia Commons has media related to Waterworld.